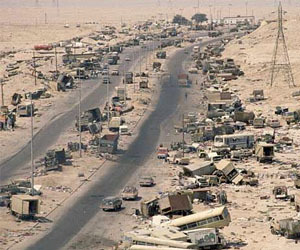 Highway of Death has become quite a popular name for certain roads of mass destruction. This sounds a bit extreme, yes, but in reality, it depicts the end of life. In some regions, there are main roads that are well-known because they travel from one big city to another. Usually, people use the term Highway of Death if there happens to be a hard turn that makes it easy for people to crash. In other cases, the term has been used to describe Highway 80 – located between Kuwait and Iraq – during the Gulf War period. The majority of the people around the United States will recognize the name related to the Middle East. The best-known location of a Highway of Death is in the Middle East, right between Kuwait City and Basra. These two cities are located in the Republic of Kuwait and Iraq, respectively. This location is considerably well known (at least by its name) because it marked the ending of the Persian Gulf War in the early nineties. There was a section of the Highway of Death, which was referred to as the Mile of Death, because of the trail of vehicles that were left behind. Certainly, hundreds of Iraqi insurgents lost their lives on this highway. It took years for the Iraqi government to rebuild the highway, especially because it led to Kuwait, a country they had a debt with. The main reason why Iraq decided to invade Kuwait was because they owed them a large amount of money and were unable to repay them promptly. During the past few years, the drug lords have virtually taken Mexico hostage. Both locals and foreigners have to watch their backs when they leave their house. Certainly, there are a few regions that aren’t affected by the violence. However, other regions such as Highway 101 on Tamaulipas can perfectly be called the Highway of Death. Sure, there are a few brave ones that need to take this road to get to their destination, but in order to do so, they make sure to travel in groups of cars at 90 miles per hour. The reason why this highway is so feared is because the drug lords have chosen it as their favorite spot to pick up hostages. They stop buses, and they simply take the passengers with them. Days later, the authorities might find piles and piles of corpses, hence receiving the name of Highway of Death. Besides war and shooting, there are other conditions that can make a regular highway turn into a highway of death. In Bolivia, there is a very well-known road called Yungas Road, which stretches 43 miles from La Paz to the city of Coroco. In Spanish, people refer to it as ‘Camino de la Muerte’, which literally means Death Road, thus Highway of Death. Every year, there are at least between 200 and 300 victims that die on this Highway of Death location. The road is extremely narrow, where there is barely enough room for two vehicles to pass at the same time.